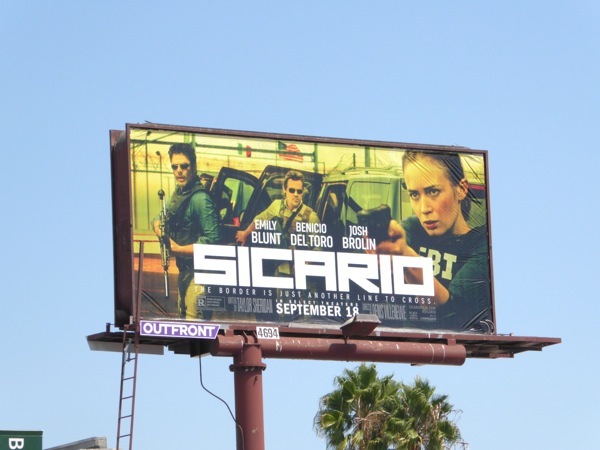 If you liked director Denis Villeneuve's intense 2013 movie Prisoners, then it looks like you're in for another treat with his new drug cartel thriller, Sicario. 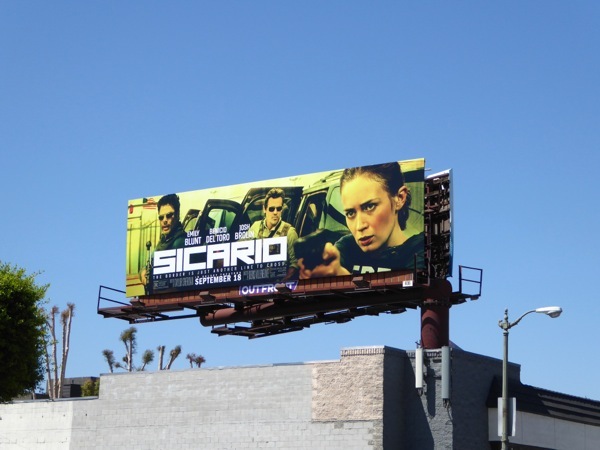 Emily Blunt is garnering all kinds of favourable reviews for her role as an idealistic FBI field agent, 'Kate Macer', who's recruited by Josh Brolin into a shadowy government task force led by Benicio Del Toro for the escalating war of drugs on the Mexico and U.S. border. 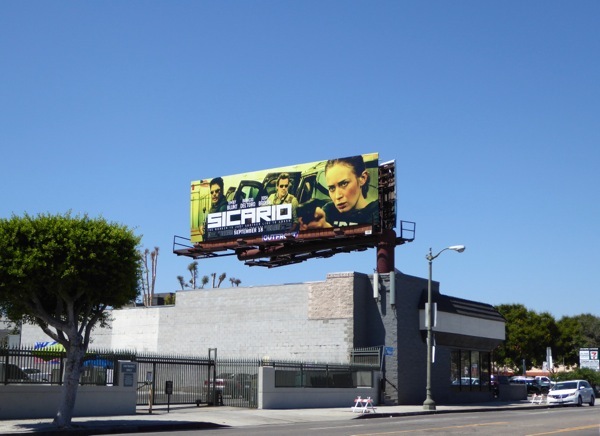 These yellow-tinted ad creatives certainly stand out from the deluge of Fall TV ads filling L.A.'s skies at the moment and suggest the drug-war action elements of the movie. 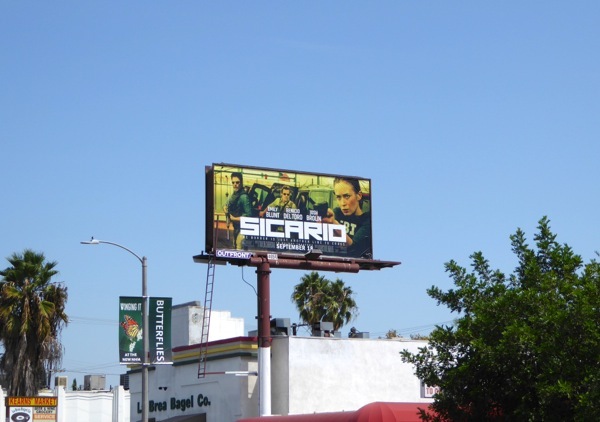 The smaller Sicario film billboard was first snapped along Beverly Boulevard on August 26, 2015, whilst the standard landscape version was photographed three days later along La Cienega Boulevard. 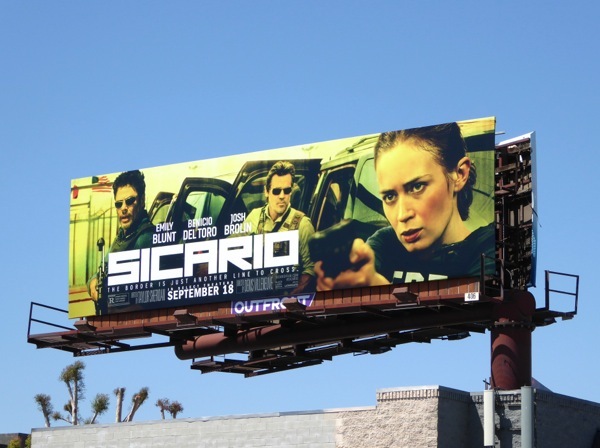 If you're a fan of the British actress, be sure to also check out Emily Blunt in these movie billboards for Edge of Tomorrow, The Five-Year Engagement movie billboards and The Adjustment Bureau film billboards. As with her tough military character in Edge of Tomorrow, it looks like this atmospheric thriller will be another welcome departure from the romantic comedies, musicals, period dramas and supporting roles the actress has starred in before.